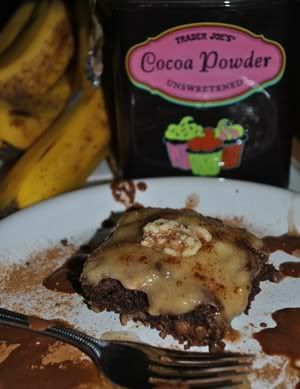 Wow these brownies are awesome with the blended bananas! Mmm, there's so many things that go good with bananas, like these pancakes. It was so hard to take a picture before eating it all up! Before I was done photographing this piece, all the brownies were gone! Four of us gobbled them right up! They are to. die. for. Have you ever tried the cocoa naturally? The outside of the cocoa fruit is white and tastes kind of like a jolly rancher. The black part of the cocoa is bitter by itself and must be offset by something sweet. In this recipe we use some agave in the mix and some blended bananas on top. Our reaction was, WOW, what doesn't go good with bananas?? Step 1: Preheat the oven to 350. Grease a 8x8 inch baking dish. In a medium sized bowl mix the cocoa and oil. Step 2: Add the agave, baking powder, walnuts, and flour. Mix well, (I had to mix mine for about 5 min). Cut the banana down lengthwise into quarter like pieces (I like the bananas chunky) and add to the brownie dough. Pour the brownie mix into the greased dish. Note: my baking dish was a bit bigger so I made sure the brownie dough was only covering half the dish, about 1/3 up the wall of the dish. The dough was thick enough to do this. Plop in the oven for about 35-45 minutes or until a tooth pick inserted into the middle comes out spotless. Step 3: In a food processor mush up 2 (frozen) bananas for the icing. This really complements the brownies nicely! If you don't have a food processor you can mush the bananas with your hand. It's much easier if you have overripe bananas (which are actually more nutritious). Spread over the brownies as an icing and DIG IN! Mmm what's a better dessert than healthy vegan brownies topped with bananas?